It rarely happens, but sometimes Scott Sumner and I disagree and that is the case presently. Scott sees Brexit as a major negative global shock, while I think that Brexit on its own is not really a big deal. The paradox is that going into the latest political and market events Scott has actually been rather relaxed about both the global economy and the US economy, while I have been a lot more worried. I have been worried that premature monetary tightening could send the US economy into recession and could blow the ‘dollar block’ up and in the process cause a major Chinese crisis and at the same time I have in the latest couple of months also started to worry that slowing nominal GDP growth in the euro zone could cause another ‘euro spasm’. I very much worry about these issues and therefore I am hardly think that the Brexit vote is doing much to help things and I personally am deeply worried and frustrated that this might to a very large extent be yet another example of increased nationalism and anti-immigrant populism across Europe, the UK and the US. But Brexit in my view is just yet another factor that could further deepen the crisis – and I have discussed the mechanics of it in my previous post – but on its own I don’t think this is a major negative shock to the global economy. It can develop into a very bad shock if monetary policy once again fails, but from what we have seen so far in the financial markets the shock is not particularly big. Yes, it is correct that we saw some rather dramatic market action on Friday and Monday, but if we look at the market action over the past week or over the past month there is nothing particularly alarming about it. Let me try to illustrate it by looking at a couple of markets. Lets start out with the dollar. This is weekly changes in EUR/USD since the beginning of 2015. The Brexit ‘shock’ is the very last down move in EUR/USD (a stronger dollar). This is consistent with what we would normally seen when we have a spike in risk aversion in the markets – the dollar as the main reserve currency of the world strengthens. Hence, we see the dollar has strengthened over the past week, but it is barely more than one standard deviation (from 2008 until today) and there has been numerous weekly moves in the dollar just since 2015 that have been significantly larger particularly during 2015. The story is more or less the same if we look at the global stock markets. This is weekly changes in the MSCI World Index of global stocks. Here the drop is slightly bigger than one standard deviation, but the drop in global stocks is not bigger than what we saw during a couple of weeks in January and February and significantly smaller than what we saw last year. This is of course only two examples, but there are other s- for example the implied volatility in the US stock market (VIX) or the change in inflation expectations (they are down in the US and the euro zone, but not a lot and actually up in the UK and Japan). My point is not that Brexit does not matter. It certainly does in all kinds of ways and it could end up being a horrible thing, but it might also – in a dream scenario – end up being a positive thing (the EU establishment will understand the message and reform and UK might not turn crazy anti-immigrant). The markets are assessing these risks and judging from that the global financial markets are telling us that Brexit in itself is not a major negative event for the global economy and even though I am sad to see the UK (potentially) leave the EU I would agree with the market – Brexit is not the end of the world. That, however, does not mean that I am particularly optimistic about the global economy at the moment. Hence, I continue to think that the Fed has been way too aggressive in terms of rate hikes and I fear that the Fed does still not understand that there is a significant risk of an US recession in the near future (even disregarding any effects from Brexit) and similarly and I am deeply concerned that we soon could have another “euro spasm” as a consequence of slowing nominal GDP growth and finally it is far too early to say that things are all well in China. On a positive note Brexit might be the “excuse” both the ECB and the Federal Reserve need to reverse course and in the case of Fed cut rates rather than hiking. In fact this is what the markets already are pricing in. And that should be remembered – because that is now the benchmark by which we should judge the Fed. Hence, if Yellen does not soon spell out that rates are more likely to be cut than being hiked then the risk of more market turmoil clearly increases. Hence, maybe the real story is not whether Boris Johnson will become British Prime Minister or whether Jean-Claude Juncker learns to behave himself, but rather the question is whether the ECB and the Fed finally will get their act together and ensure a re-anchoring of inflation expectations. I am not too optimistic on that part. Brexit is on everybody’s mind and even before the – for the markets – surprising “Leave” vote on Thursday the British EU referendum was the dominating theme in the markets for awhile. When the news came out early Friday morning, the global financial markets reacted strongly. That is the kind of reaction we are used to when we have a major “risk off” shock – stock markets drop sharply, the yield curve flattens, market inflation expectations drop, the pound weakens significantly and the dollar strengthens. However, the question is what kind of shock it really is. The answer is that the Brexit shock initially is a supply shock that turns into a demand shock. I will try to explain that in this post. The fact that the Brits voted to leave the EU in my view best can be described as what Robert Higgs called “regime uncertainty”. A shock that increases regime uncertainty is essentially a shock that increases uncertainty about the overall institutional framework in the economy – in this case: Will the UK be a member of the EU’s single market in the future? What will Brexit mean to the free movement of labour in Europe? Will UK banks be able to operate freely as before in other EU countries etc.? This is the regime uncertainty regarding the UK economy, but equally, we have increased regime uncertainty within the EU. Will this for example lead to other countries leaving? Will this cause the “new” to drift in a more interventionist direction? Will this make it harder to get reforms through? Essentially such regime uncertainty is a negative supply shock that should cause real GDP (growth) to drop in both the EU and the UK and cause an increase in inflation. This in itself is bad enough but the historical experience shows that such shocks rarely have major impact and are of a relatively short-lived character and most observers of the situation likely would also agree that the EU and the UK will have a common interest in finding a solution that overall keeps the UK as part of the EU’s single market and realistically then it would not be unreasonable to assume that the overall level of tariffs and trade barriers in the UK and the EU will not be much changed in 5-10 years time. So yes, Brexit has increased regime uncertainty, but on its own it shouldn’t be a matter that significantly should change the medium-term outlook for the EU and the UK economies. So while we have seen an increase in regime uncertainty, I believe a more important factor is what is happening to monetary conditions as a second order effect of the increase in regime uncertainty. First of all, it is clear that Brexit has caused an increase in particular demand for US dollar and other safe assets. This is essentially a precautionary increase in money demand and for a given money base this a passive tightening of monetary conditions. Given that both the Bank of England, the ECB and the Federal Reserve are targeting interest rates (using them as a policy instrument rather than using the money base) and that all three central banks have interest rates close to the Zero Lower Bound (ZLB) a drop in the natural interest rate (caused by a negative supply shock) will cause an increase in the difference between the policy rate(s) and the natural interest rate(s), which effectively is a tightening of monetary conditions. This would not be a problem if interest rates where significantly above the ZLB as markets then just would expect central banks to cut rates. Similarly, it wouldn’t be a problem – even at the ZLB – if central banks were using the money base as a policy instrument as that would mean the central bank always would be able to ease monetary policy. Unfortunately, both the ECB and the Federal Reserve do not seem overly eager to re-start/step up quantitative easing. As such, they have mentally committed themselves to a “liquidity trap”, which means that negative supply shocks automatically also turn into negative demand shocks. It wouldn’t have to be this way and the Bank of England, which the markets clear perceive to be more willing to step up quantitative easing if necessary, in fact provides a good example of this. Hence, while inflation expectations have dropped both in the euro zone and the US, the opposite is the case in the UK where inflation expectations actually has to increase – and has been more or less flat over the past month. This clearly indicates that the markets expect the BoE to try to offset the negative shock from Brexit by easing monetary conditions. This by the way also give some reason to be optimistic about the macroeconomic impact of Brexit even in the near term. In this regard, it is also notable that we have seen a sharper increase in the Credit Default Swap (CDS) on Italy than on the UK CDS on the back of Brexit. Said in another way, Brexit is hitting the euro zone harder than the UK. Why is that? To me, the difference is that the UK has a floating exchange rate and a central bank willing to offset negative shocks, while Italy or other euro zone countries do not have an independent monetary policy to offset the shock from Brexit and the ECB likely also is less willing to ease monetary policy than the Bank of England is. Yes, I know – it is Lars’ Law: Always blame the ECB. But I can’t help myself. It is clear to me that had the ECB been committed to at least hitting its inflation target and the markets had seen this target as credible, supply shock in the form of increased regime uncertainty would have had a much smaller negative impact than presently seems to be the case. It is the failure of not only the ECB, but also of the Federal Reserve to ensure nominal stability and well-anchored inflation expectations that is magnifying this crisis. Finally, I would like to note that even though distress has increased in the global financial markets since Thursday, there is no reason to panic over this “event” on its own. Had we had credible inflation targeting or even better, nominal GDP targeting central banks in Europe and the US then this would not be a big deal even for the global economy. In fact, even taking into account the lack of credibility of the Fed and the ECB the market reaction might not have been quite a big as some (like my friends Scott Sumner and David Beckworth) seem to believe. Hence, if we look at for example the global stock markets they are little changes over the past 1-2 weeks. The same goes for the dollar and the global commodity markets. And most importantly, even though the shock has caused inflation expectations to drop – the drop has not in anyway been major. Therefore, I actually believe that the focus should not really be on Brexit in itself. Rather I think it is much more worrying that the Federal Reserve has been overly eager to hike interest rates and as a consequence US inflation expectations have continued to decline since 2014. Obviously as I discussed above these issued are linked in the since that the continued de-anchoring of inflation expectations both in the US and the euro zone increase the risk that any shock will be significantly amplified by lack of monetary policy credibility. Therefore, it is of utmost importance that both the Fed and the ECB ensure nominal stability. That would mean a much stronger commitment to anchoring inflation expectations at 2% and a clear announcement that both central banks will increase money base growth if necessary to ensure their nominal targets. Unfortunately we have yet to see such commitment. David Beckworth has a great interview with my friend and great hero Robert Hetzel. Listen here. Here we go…10-year government bond yields just dropped below zero. Does that mean that euro monetary policy conditions are “ultra easy”? Nope certainly not – it is rather the opposite. The story is the same – monetary policy is TIGHT and is becoming tighter as the demand for money increases faster than the supply of money. I am in Munich today to do a presentation on Brexit at the European Institute COO-CFO Roundtable. As I was leaving home this morning I brought along Hayek’s classic The Road to Serfdom. I realized it was at least two decades since I had read it (all) last time so I thought it could be interesting to read it again. It is worth recalling that the idea of the world at last finding peace through the absorption of the the separate states in large federated groups and ultimately perhaps in one single federation, far from being new, was indeed the ideal of almost all the liberal thinkers of the nineteenth century. From Tennyson, whose much-quoted vision of the “battle of the air” is followed by a vision of the federation of the people which will follow their last great fight, right down to the end of the century that final achievement of a federal organization remained the ever recurring hope of the next great step in the advance of civilization. In fact in his 1938-article “The Economic Conditions of Inter-State Federalism” Hayekmakes an argument for Federalism (even arguing for some kind of monetary union ! ), which surely could give some ammunition for the “remain” campaign. And this pretty well sums up the dilemma for the classical liberal in the discussion over Brexit. There are classical liberal arguments both in favour and in against Brexit. PS Listen to Tyler Cowen talk about “The Economic Conditions of Inter-State Federalism” here. PPS The example of a Hayekian “remainer” in my view is the Dalibor Rohac, who in his new book “Towards An Imperfect Union – A Conservative Case for the EU” makes a strong Hayekian case for the EU. If you want to hear me speak about these topics or other related topics don’t hesitate to contact my speaker agency Specialist Speakers – e-mail: daniel@specialistspeakers.com or myself at lc@mamoadvisory. Friday’s US labour market report was a huge disappointment. This graph explains why. 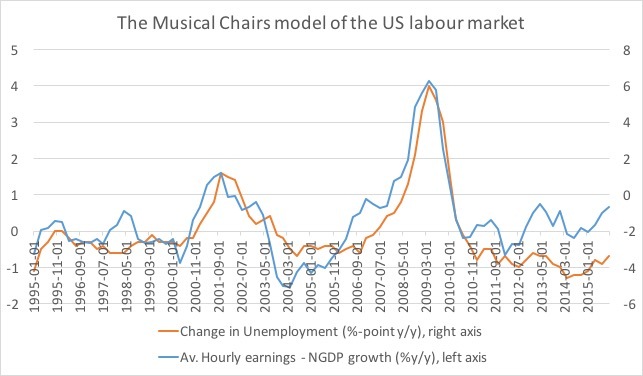 This is of course Scott Sumner’s Musical Chairs model of the US labour markets. Simply said the model predicts unemployment to rise if demand growth (nominal GDP) slows relative to the growth of labour costs (average hourly earnings). With monetary conditions tightening (NGDP growth slowing) and minimum wage hikes helping push up wage growth it should hardly be surprising that we are now seeing a softening of US labour market conditions. It is not dramatic, but there can be little doubt about the trend and it is essentially the same kind of policy mistakes that we saw in the 1930s – too tight monetary policy combined with labour regulation that push up wage growth. Scott of course documents this very well in his new book the Midas Paradox.